As a frequent flyer, I’m a big fan of high end luggage brands like Tumi, Rimowa and GoRuck. However, not everyone is willing to pay high ticket prices for airline carry on luggage. With this article, I’m hoping to show that scrimping on pennies when buying luggage will actually cost you money in the long run. High end luggage brands are not just for road warriors, business travellers and frequent flyers. By investing in good quality, premium luggage brands even casual travellers can save money and hassle. Husbands of the world, relax. I’m not saying you should buy the wife Louis Vuitton or Gucci luggage, or similar luxury luggage brands. They’re just too expensive and fashion brands, not proper luggage brands in my opinion. High end luggage brands help you travel better, fashion luggage brands don’t – they just look nice in the baggage hall. What I would class as high end luggage brands are established worldwide brands such as Tumi, Rimowa, Victorinox or Briggs & Riley, that are often more expensive than entry level luggage brands. I’ve included GoRuck, as their prices and products are quite more expensive than their competitors, even though they are focussed more on tactical equipment than luggage or fashion. As we will see, there are many reasons – other than fashion trends – that make these brands ‘high end’, and why it’s worth investing in them. In reality, there’s no real measure to determine a luggage brand as ‘high end’ or ‘entry level’ or even ‘luxury’. However, I would base it on four distinct criteria (five if you include price) and these are why it’s worth investing in high end luggage brands. High end luggage brands use high-class manufacturing and processes to build quality into their luggage. No scrimping on stitching, no cheap components, no handles that fall off. Quality brands adopt rigorous testing and quality control processes that mimic real-life usage. This is why my airline carry on luggage still is, bar minor scuffing, in almost exactly the same condition as when I purchased it. No sagging, no defects and still ‘good as new’. High end luggage brands invest heavily in Research and Development and use revolutionary materials. My Tumi Alpha Bravo Kessler Duffel is ballistic nylon and my Rimowa Salsa Cabin Multiwheel uses polycarbonate that’s at least 2kg lighter than its counterparts. Consequently, my luggage is stronger, lighter and more durable than cheaper brands. This is perhaps the most important criteria – as it’s the one I have benefitted from, and missed out on with using cheaper brands before. High end luggage brands offer a far more inclusive and robust guarantee than entry level luggage brands, usually involving a collect/repair/return free service or a far longer (even lifetime!) warranty. A handle on my was broken by baggage handler negligence, yet Victorinox offered to collect the luggage by courier and return it to me when repaired. The retractable handle on my was damaged slightly at a hotel, and Tumi collected the case, repaired it and returned to me in a few days. To date, there’s been no defects with either my GR2 or Rimowa Salsa Multiwheel (which speaks for itself!). GoRuck offer a lifetime warranty through their GoRuck Scars program, and Rimowa offer a guarantee on almost all working parts of the cases. The high end luggage brands spend a lot of time on ergonomics – how a case or backpacks fits the body and usage. Additionally, each component tends to work better, longer and easier than cheaper brands. For example, Rimowa has castors than allow the case to be dragged or rolled vertically. Tumi often incorporate really clever design twists – such as sealable dry/wet pockets. GoRuck allow adaptability and customisation to their backpacks by fitting MOLLE straps to allow other accessories to be fitted. Price is often far higher than seemingly similar cases, but on closer inspection it’s not a ‘like for like’ comparison. That Rimowa case with the inbuilt compression straps to allows you a further 20% space? The GoRuck GR2 with the padded back pocket for laptop protection? The Tumi handle that’s lockable at different heights? All of these features may add to the price, but all provide added value for the traveller. Rollers are perhaps the easiest way to tell if a case is from high end luggage brands. Look for spinning and rotating castors, rather than just a thin wheel, and especially ones that allow the case to be moved vertically (as it saves effort dragging). That Rimowa case with the inbuilt compression straps to allows you a further 20% space? When it comes to luggage, if you buy cheap, you buy twice. I’ve had these bags several years and they’ve took lots of hammers on planes, trains, 4x4s and everything inbetween. Looking at them today, bar a few minor scuffs, they still look good as new.Nothing’s broken or fallen off, and there’s no reason to expect anything will for years to come. Ask yourself if that $100 case will last more than a couple of dodgy baggage handlers, and you begin to see why it’s worth investing in high end luggage brands. With their amazing guarantees, it’s unlikely you will need to replace high end luggage brands. So it’s really a question of investing now to save in the future, which always make sense, right? As an added bonus, high end luggage brands are always sought after items on the secondary market. eBay and Amazon are awash with people looking for used high end luggage brands, as they often don’t want to pay the full price from new. I’ve sold off several of my cases (a couple of Tumis and a Victorinox) on eBay UK, and always received at least half my purchase price back. Given that Rimowa are often a couple of kilos lighter than most others, if you need to check a bag in that could save you around $20/kg. Just think of all those excess baggage fees or checked baggage costs you could be saving with an ultralight airline carry on luggage. 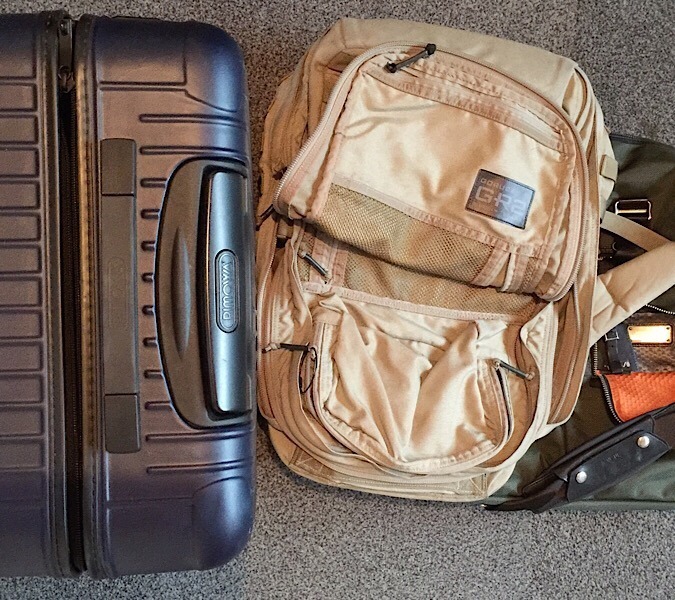 If you use a backpack like the GoRuck GR2, you’re gaining loads of space over a carry on case. Consequently, you can pack more in than a case, and even more weight. My current record is repeatedly sneaking on board 19kg+ in my GR2 – thus avoiding checked baggage costs. My preferred cabin roller is the Salsa Cabin Multiwheel – which is exactly the same case that Lufthansa cabin crew use. And we all know the Germans know a thing about two about quality engineering, right? What I like about the Salsa Cabin Multiwheel: it’s extremely lightweight – 2kgs less than it’s competitors – and it has two great compartments. One side has an internal pocket that’s ideal for keeping shirts folded and wrinkle-free. Added bonus: the shirt pocket acts as a compression divider, so you can pack even more stuff in. My preferred cabin roller is the Salsa Cabin Multiwheel – which is exactly the same case that Lufthansa cabin crew use. My preferred rucksack is the GoRuck GR2 – nothing, I repeat, nothing compares to it. It’s so good, Sinead O’Connor sung a Prince song about it. You see many imitators at a fraction of the cost, but they’re cheap for a reason – they don’t last. What I like about the GoRuck GR2: it’s literally bombproof, it’s super-tough yet comfortable and is ideal for packing the world into. It still fits into any cabin restricted size frame, yet it holds so much more than a hard-sided roller. It also opens fully – taking design inspiration from a military medical pack – and has a multitude of pockets. My preferred rucksack is the GoRuck GR2 – nothing, I repeat, nothing compares to it. My preferred duffel is the Tumi Alpha Bravo Kessler, but they’re so popular they’re difficult to find availability. What I like about the Tumi Alpha Bravo Kessler: the bag looks and feels amazing, is totally flexible enough to fit anywhere yet still looks a million dollars. A multitude of innovative features – barcode tracking direct to Tumi, carabiners for keys, wet/dry sections for laundry/shoes (to keep smells enclosed) – means you’re going to travel organised. Here’s a Youtube explainer video I made about the case for high end luggage brands. Which series do you think are the best high end luggage brands? Join the conversation below by letting us know what’s your favourite case, backpack or duffel – and why? Thanks for the comments, which luggage brands do you use? Why not sign up to the newsletter to get all the articles delivered to your mail weekly – free?